The month of November is a time when people start planning what they like to do in the coming holiday season. As Christmas is very much approaching during this month, many of the families are starting to look for a great place to enjoy the season, whether they’ll be contented to enjoy staying at home or find a place where they can have more fun and excitement. If you are looking for the best place to enjoy the season, look no farther than Old Time Christmas at Silver Dollar City in Branson as it features great holiday events, exciting attractions and live entertainment shows. This is a perfect place to spend a wonderful holiday escapade with your family from the crowded city streets. 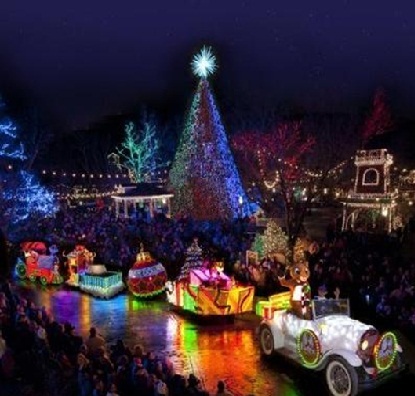 Old Time Christmas at Silver Dollar City is one of the most visited attractions in Branson where you can see the true meaning of the magical season amidst the glow of dazzling lights, decorated Christmas Trees, Holiday Light Parade, and two Broadway-style productions. Take home with you these beautiful holiday experience that is sure to give you a lasting memory. A wonderful Old Time Christmas is an old-fashioned way of celebrating Christmas that starts in November till the end of December. So, don’t miss to see some of the most wonderful Christmas attractions in Branson this holiday season. The Old Time Christmas festivities will start at the Town Square and will feature a light display named “Christmas On Main Street.” There will be a dazzling display of Christmas tree equivalent to five stories high and is visible at the central point in the square. This huge Christmas tree is decorated with 300,000 lights that make the square full of Christmas spirit. The streets all over the place are lit with holiday lights. Christmas music can be heard in every corner of the park. Many holiday songs including traditional carols are heard all over the park giving visitors a memorable musical experience. Visitors will also enjoy holiday music during stage performances at the “Opera House Theater” at Silver Dollar City. You will also enjoy “The Christmas Carol” by Charles Dickens in the theater. Fourteen actors are performing in this musical show with special effects and beautiful scenery at par with Broadway Show. The “Living Nativity” is another great performance show not to be missed as it will take you back to the time of the birth of Jesus Christ in Bethlehem. There will also be a light parade that marches through the city streets twice every evening where an Old Time Christmas provides fun to visitors of all ages. During this Christmas festivity at Silver Dollar City, a traditional Christmas cooking can also be savored to make everyone’s stay a memorable one. Christmas pudding, hot chocolates and roasted chestnuts can also be enjoyed at the park. So, if you want to enjoy the fun with the Old Time Christmas attraction in Branson, visit Silver Dollar City where you can have the best of the holiday season.